This East Side enclave has roots in early Sonoma winemaking and offers a unique opportunity to own a piece of historic Sonoma. A one-of-a-kind property that transports you to another time…when entertaining was an art and gracious hospitality a way of life. The property is on the National and State Registers. Located in Sonoma’s coveted downtown East Side residential area, this unique vintage estate is one and a half blocks from the historic Plaza and within walking distance to wineries. Nestled along Nathanson Creek and surrounded by lush mature gardens, the charming property is approximately 1⁄2 acre, with 2 homes and 3 suites, and has operated as the Victorian Garden Inn Bed and Breakfast for 30 years. The farmhouse structures are set apart from each other, and privacy is naturally enhanced by the romantic gardens. Built in the early 1870's, the 2 bedroom, 1.5 bath Greek Revival Victorian Farmhouse epitomizes 19th Century country elegance. Distinctive Victorian elements include exterior hand carved embellishments, a wraparound veranda, finely crafted original oak staircase and floors, stately 10’ ceilings, embossed and bead board wainscoting, cozy wood burning fireplace with elegant wood mantel, banks of nostalgic wood sashed windows, original doors and classic Victorian fixtures. A bright kitchen with vintage charm boasts a butler’s pantry and laundry area. Adjoining the kitchen is an elegant formal dining room with views of the picturesque garden and access to the serene grounds. Unusual for the west coast, there is a large basement with exposed stonework; perfect for wine and general cold storage. The secluded second residence was once the farmhouse barn. It was lovingly restored and creatively converted into a charming 2 bedroom and 2 bath cottage style home. The intimate size and use of woods throughout give this home timeless character and the feeling of warmth. Features include fir floors, ingenious custom built-ins, gas fireplace and a charming, light-filled kitchen that opens to a private creek side patio and garden. The quaint front entrance is covered and extends to the accessible two-car garage with office. The cottage is fully enclosed with access to the grounds through a private gate and includes a separate entrance with its own postal address. Originally the tank house, this period building once served as the water tower, and was carefully converted into 3 large suites maintaining the original character, each with a unique motif and private access. The upper suite features wood floors, high ceilings, a window nook and a full bath. The suite below features wood floors, a gas fireplace, charming wood details, and a full bath with a classic claw foot tub. The end suite is the largest and offers a spacious living room with wood fireplace, a full bath with claw foot soaking tub and a serene private covered patio. 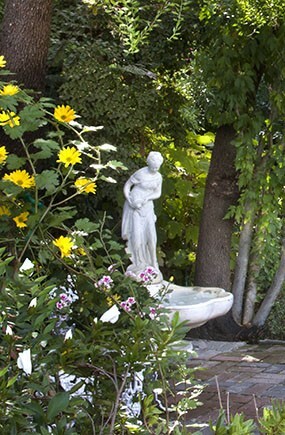 Charming brick paths, lined with fragrant botanicals and fruit trees, wend throughout the breathtaking gardens. Numerous hidden and prominent patios are surrounded by mature trees such as the two coveted ancient olive trees that grace the front garden. An impressive wall of Cypress provides separation and privacy for the large, sundrenched pool with vine-covered arbor. Here you will find roses, bougainvillea, hydrangea, fig, loquat, kiwis, citrus and stone fruit trees, chrysanthemum, hedges and more. A hidden private courtyard provides a tranquil spot to enjoy the spa. This distinguished estate is the most outstanding example of the Greek revival farmhouse during the late 1800・s in Sonoma, and has been privately owned for the past 30 years. This is a rare opportunity to own an historic jewel in the heart of the wine country. DISCLAIMER: Sotheby's International Realty ® and the Sotheby’s International Realty logo are registered (or unregistered) service marks used with permission. Operated by Sotheby’s International Realty, Inc. The information set forth on this site is based upon information which we consider reliable, but we cannot represent that it is accurate or complete, and it should not be relied upon as such. The offerings are subject to errors, omissions, changes, including price, or withdrawal without notice.